Watch your favourite video songs and movies in video player. It supports DivX, MP4, H.263, H.264, WMV file types. 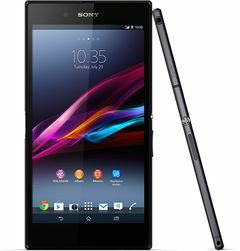 The Sony Xperia Z Ultra takes the phablet concept, adds a bit more size, a lot more elegance and throws in specs to die for. One of the greatest phones from another great brand. A bit large to hold. M in love with this monster. Even 5.5 inches mobile looks so smaller in front of z ultra. I have been using this smartphone for over a year and the performance still remains the same. Sony has been making great phones for years, but what makes this phone different from others is its 6.4" screen size. This is really a boon for those who are fond of watching movies and videos on their smartphones. However, this model didn't recieve much great response due to its "Being Different" factor and also due to its initial market price. The main reason you should go for this smartphone is that it doesn't go down on it's performance since the day one till the time you use it. Also it has Bravia engine that lets you watch videos in real High Definition. This phone initially comes with Android Jellybean 4.2 and now it has Android Lollipop 5.1. Also there is planned upgrade for Android Marshmallow 6.0 (Not Sure). 3050 mAh Long Life Battery.